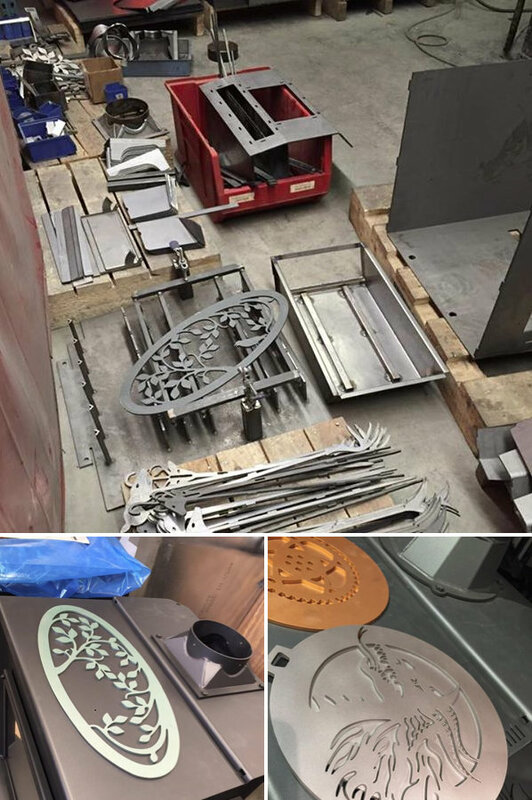 A recent visitor to our factory graced our facebook page with a beautiful collage of pictures taken during a tour. You can view the page here. We are thrilled our visitors shared their pictures. We thought we would take a moment to share them with you, and hope you enjoy them as much as we do. If you are in the area, we invite you to stop in and visit our showroom, explore the stoves we have on display, and take a tour of our factory. Our showroom/factory hours are 9:00 to 5:00, Monday thru Saturday. No appointment is needed. 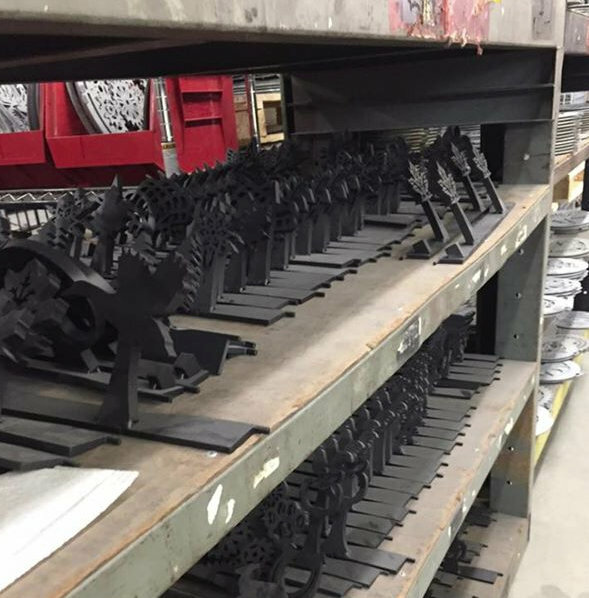 Our fabricators, welders, and other employees are busy in the factory until 3:30, Monday thru Friday, but they do not mind a visit from you. When you first enter our factory area, you may come across an Ideal Steel Hybrid stove (or two, three or more) that are in the inspection phase. Before your stove is shipped, it gets thoroughly inspected to make sure everything is working as it should. 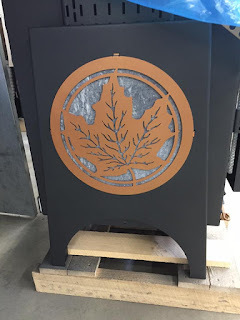 This particular stove has the maple leaf design (NAT006) on it. Looks like these folks are getting a close up view of the front of the Ideal Steel and the ash pan. Sitting near the Ideal Steel Stoves, waiting for inspection, is our newest stove, the Absolute Steel Hybrid. This one is black, and has the Prairie Wheat pattern in Metallic Mahogany. We have been building Absolute Steel beta stoves for test purposes. We should have comments and results regarding UL clearance and other information for our new Absolute Steel Stoves posted soon. As you walk towards the rear of our factory, you will go through the area where our Fireview, Keystone and Palladian stoves are made. This picture shows some of our Ideal Steel Andirons which are lined up, waiting to be installed into a stove or shipped to a customer. 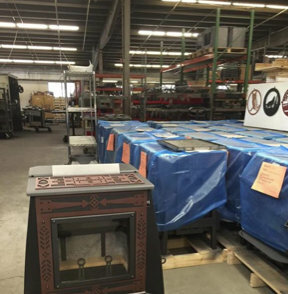 Moving along through the Fireview section, we find a Fireview stove which is complete, waiting to be crated for shipment. 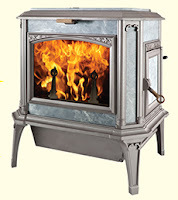 For over 38 years we have been building stoves and warming homes. From cast iron, soapstone, tubular steel, flat sheets of metal, designer art work, with fewer emissions and greater fuel efficiency, our engineers and employees never stop creating and designing. We all work hard to bring the best product we can to our customers. We enjoy having folks come to our showroom, and to see first hand what we do and how we do it. We are open 9-5 Monday thru Saturday. 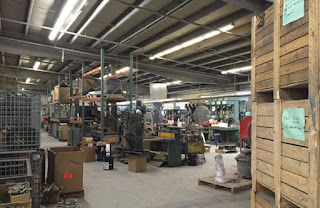 You may have a factory tour any time we are open, with no special arrangements needed ahead of time. Keep in mind that the shop is active until 3:30 in the afternoon, Monday thru Friday. We hope to see you soon! The temperatures have dropped and it is freezing outside! At least it is where we are. This is when it is especially important to optimize your wood stove, to get maximum heat and enjoyment for minimal wood usage. The pipe needs to be clean. Chimney cap (if you have one) needs to be free from obstruction. Combustor needs to be clean. Vacuum all sides. If you have a stainless steel combustor, you can spray the combustor with a solution of 50% distilled water and 50% white vinegar. Let it drain, then rinse well with clear distilled water and let dry completely before putting the combustor back into your stove. Using the vinegar solution may help to clean baked on fly ash. 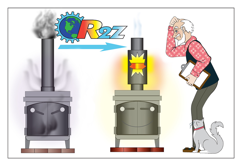 You can learn more about cleaning your Progress Hybrid combustor here, the Fireview combustor cleaning information is here, and the instructions for cleaning your combustor if you have a Keystone or Palladian stove is here. The ash pan should be clean, and the bottom of the stove should not have too much ash. Wood should be dry. For the best heat output from your stove, wood should be well seasoned. Most wood will take one to two years split and stacked, and covered on the top (tarp or other protection) to dry properly. If your wood is not dry, you will find much of the heat your stove is generating will be absorbed by burning off the moisture in your wood. 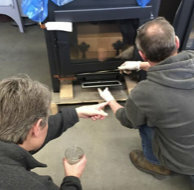 If your wood is not as dry as you would like, mix it with kiln dried, or with compressed wood chip logs (available at most hardware stores, lumber yards or home/garden centers in the heating season), or you may need to leave your air setting open a bit more for more heat in the firebox. Check your gaskets (when the stove is not hot). If you think your stove is getting too hot, check your gaskets for leaks. This is a primary cause for your stove to overfire. The paper test is an easy test to check the door gaskets. Simply take a strip of regular paper, put it into the side of the door. Close the door. If you can easily slide the paper out, you need new door gaskets, or perhaps you need to adjust the door latch. 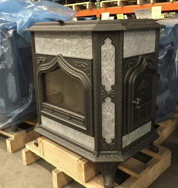 Now that your stove is in prime condition, and your wood is in good condition, it is time to sit back and enjoy the dancing flame show that only a Woodstock Soapstone Stove can give. Pour your favorite beverage, or perhaps put a pot of cider on the top of your stove (a little cinnamon never hurts) and you can enjoy a tasty beverage and wonderful smells while you watch your light show. When there is a major storm in the forecast, it means many of us may loose our electricity. This is when it is very, very nice to have a Woodstock Soapstone Stove. Water can be heated on a wood stove, but I can also cook dinner on my wood stove. This is a wonderful thing, especially when the power is out. We have heard from some of our amazing customers about how fabulous it is to be able to create meals on their Woodstock Soapstone Stoves, and we thought we would share two of our recipes and a few quotes from our customers. Keep in mind there may be times it will be necessary to elevate your Dutch oven to protect the contents from becoming too hot, or to allow the contents to cook evenly, such as when baking/cooking bread. A metal or cast iron trivet works well for this, just make sure you do not have rubber or plastic feet on anything you place on top of a hot wood stove. Starting with soup; we have a recipe for Homemade Vegetable Soup. 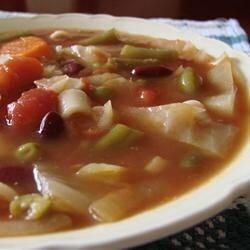 Place all of the vegetables in large pot and add the bouillon and water. If adding meat, cooked is better, but if it is raw, brown in butter first, then add to pot. Add remaining ingredients, and simmer for at least 3 hours. We usually cook our soups 4 to 5 hours. Check liquid level every now and then. Otherwise, let it simmer. I usually put it toward the back of the wood stove as well, where it’s hotter. If it seems to be getting too hot, move it to the front. Serve with fresh bread for an unbelievably good meal and just the right thing for a cold winter night. Yields 3 to 4 servings. If you're using regular flour - add one teaspoon of salt and 3 teaspoons of baking powder to the flower before adding the beer and sugar to the flour. In a large bowl, mix together the sugar and flour. Add beer and continue to mix. Batter will be sticky. When all of the ingredients are throughly combined, put into a 9 x 5 inch greased loaf pan. Bake at 350 degrees F (use your on-the-stove thermometer) for 50 for 60 minutes. The top will be crunchy, and the insides will be soft. Serve topped with butter or cheese spread. We hope you enjoy these two recipes for cooking on your wood stove. 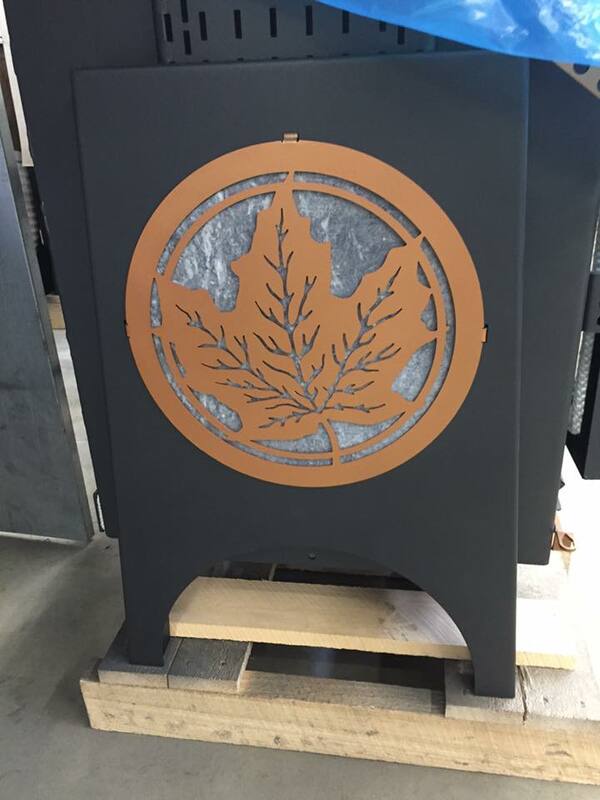 We would love to hear about your experiences with your Woodstock Soapstone Wood Stoves. Check out our facebook page here. We invite you to post your pictures, and your stories of how you survive without power. If you want to read more about cooking on our stoves, click here. A welcome correction (0.5 g/hr emissions!) is more good news. We initially reported a weighted average emission (the number the EPA reports) of 0.7 g/hr. An error was made. Our weighted average emission is actually 0.5 g/hr. This is, of course, very good news! Results of individual runs and weighted averages are in the chart below.